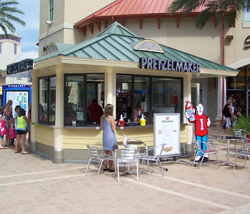 Pizitz Management Group in Destin, Florida, announced that the grand opening for the first stand-alone retail vending kiosks for Great American Cookies and Pretzelmaker took place June 3 in the Destin Commons retail area. Gift bags and mugs were provided for the first 200 customers. The gift bags included crayons, stickers, brochures, coupons, and pens. Customers also sampled from a giant, freshly baked 6’x4’ “Super Cookie Cake,” weighing more than 40 pounds, as well as Pretzelmaker’s signature Pretzel Bites at the event. Both kiosks offer a full range of snack foods, beverages, and desserts to satisfy children and adults alike. These refreshments include iced cookies, Cookie Cakes, brownies, Coke, and Icee products from Great American Cookies, as well as Nathan’s hotdogs, polish sausage dogs with all of the trimmings, pretzels, and pretzel bites from Pretzelmaker. The design of these kiosks is a joint venture by Turnberry Associates in Aventura, Florida; Morton Gruber, AIA, an architect based in Atlanta; and Design Build Services of Tampa, Florida. The kiosks are unique in that they are the first of their kind for Great American Cookies and Pretzelmaker. The custom units were designed to both complement Destin Commons’ architectural feel as well as meet the essential needs required for both facilities. The project presented a tremendous challenge as power, water and sewer services had to be installed to the kiosks without disrupting business at the shopping center. Each kiosk provides approximately 180 square feet of workable space complete with onsite full baking equipment, ice makers, and humidity control showcases. The kiosks contain 140 MPH Hurricane Impact glass with low-E insulated glass and are engineered to Florida Building Codes.